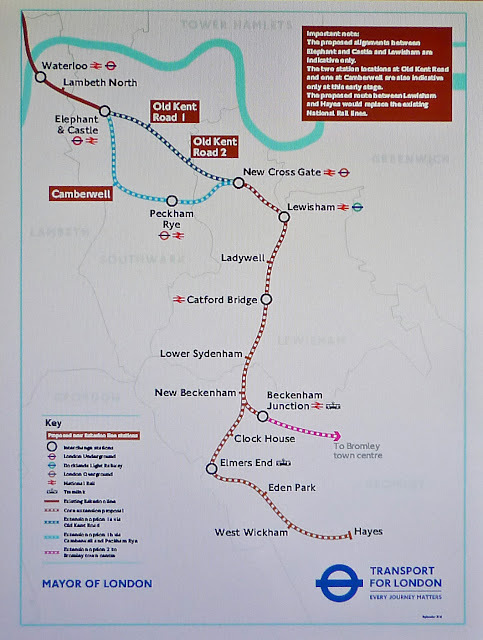 Transport for London (TfL) has confirmed it will be taking the next vital steps on the proposed new Bakerloo line extension and will begin the detailed technical work in 2016 to build a case for extending the line from Elephant and Castle to Lewisham via Old Kent Road. This would allow TfL to seek permission from Government to start the construction of the extension by 2020. If the project is given the green light, construction is expected to start around 2024. By terminating at Lewisham, an extension could be open by 2030, delivering significant benefits across south east London. Passengers travelling to central London from Lewisham, New Cross and the Old Kent Road would benefit from more frequent services and faster journey times with the Bakerloo Line extension, delivering capacity for 65,000 new trips in each direction. With the Capital’s population growing to 10m by 2030 from 8.6m today, extending the Bakerloo line is vital in helping support the anticipated growth in south London by providing improved transport infrastructure and enabling regeneration in a number of the Mayor of London’s key Opportunity Areas including Elephant and Castle, the Old Kent Road, New Cross Gate and Lewisham. TfL carried out an initial public consultation in Autumn 2014 on route options for extending the line south of Elephant & Castle. More than 15,000 people responded, with 96 per cent in favour of an extension. Since then, further work has been carried out to assess a number of possible routes and stations, including options serving over 200 alternative destinations that were suggested during the consultation. TfL has today published a summary report of how the various options have been assessed against their potential to unlock new homes and improve transport provision in south east London. The report indicates that a route to Lewisham via Old Kent Road has the strongest case, with potential to support the building of 25,000 new homes by improving transport accessibility and capacity along the route. Further work is also underway to look at the wider rail network to ensure that it gets the vital investment it needs to support growth in London and the South East. Beyond Lewisham, TfL is working closely with Network Rail and the DfT to develop improvements to the rail network, such as capacity enhancements to allow for more frequent trains, which will complement and add to the Bakerloo line extension. The Mayor and TfL will be working closely with Network Rail and Southwark Council on plans for a new Thameslink station at Camberwell. This new station would reduce journey times into central London by up to 20 minutes, and by providing connections to the Underground and Crossrail, will improve access from Camberwell to locations across London. Funding options for the extension are being considered. There is potential to look at similar funding mechanisms as that being used for the Northern line extension, seeking contributions from new residential and commercial developments along the proposed extension. Subject to funding and securing powers the extension could be completed by 2030.